The Bechtler Museum of Modern Art is a powerful and imaginative setting for events and meetings. Located at the Levine Center for the Arts, within walking distance of the Charlotte Convention Center, the Bechtler is a unique space designed by internationally acclaimed architect Mario Botta. 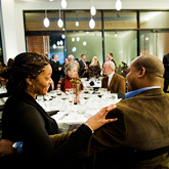 In addition to museum event rentals for corporate and nonprofit organizations, the Bechtler now provides rental space for private parties and social functions such as weddings, birthdays or anniversaries. To request more information or to schedule a site visit, email events@bechtler.org. Please include your preferred dates, start and end times, guest count and any other specifics about your event. Click here to start the booking process by giving us a little information about your event! The Bechtler Museum of Modern Art offers museum event rentals for social functions such as anniversaries, bar mitzvahs, birthdays, family reunions, wedding celebrations and more. Clients can reserve the museum’s lobby, sculpture terrace or classroom for private parties and special events. To request a site visit, email events@bechtler.org.